The whole family went to NYC this weekend. My mother had gotten all the grandkids tickets to see the latest of the Little Orchestra Society's performance at Avery Fischer Hall, part of Lincoln Center. The best part was that this was the world premier of "The Composer is Dead" by Lemony Snicket. We went to the 1pm performance and met my parents as well as my brother's family. The orchestra performed 2 pieces with the first being the story of the Pied Piper. Kimmy liked this part but Katie thought the music was a little scary. It had a cool ending where they had about 30 kids aged 8 to probably 14 each playing an instrument (28 flutes and 2 drums) and they marched down the aisle and up on to stage. The second half of the performance was of the new piece "The Composer is Dead." Daniel Handler - Lemony Snicket's 'representative' narrated the piece while the orchestra played the parts. It is a mystery where we try and figure out which instrument killed the composer and the narrator is the inspector. Everyone in the family loved the performance. Dad liked the music and enjoyed the mystery at the same time (it was better than okay which is a ringing endorsement from him). 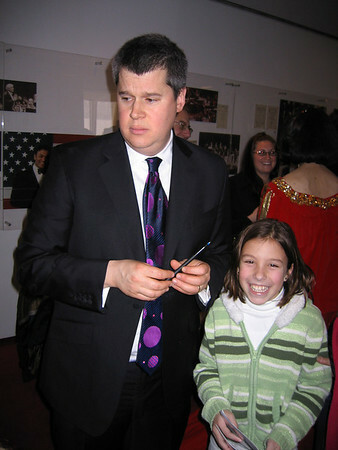 Daniel Handler is a natural when it comes to being on stage. We were all laughing during the show. The best part though was after the show. 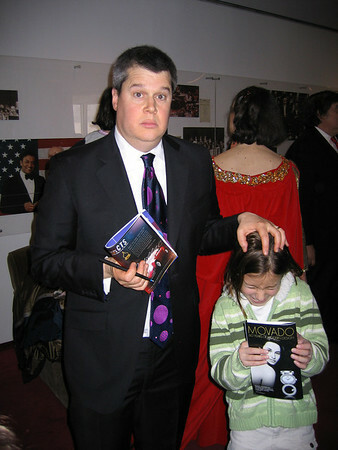 Dad managed to get us passes to the green room and the kids got to meet Daniel Handler and get their programs signed. He has a sense of humor after my Dad's own heart and yes he is just like the Lemony Snicket books, sarcastic, funny, and nice at the same time. We weren't allowed to use camera's during the performance but I brought my 5 year old digital point and shoot and got 2 pictures with Kimmy and Lemony - oops I mean Daniel. Sorry I missed this! I think Daniel Handler's brilliant. HI! I am a school librarian and I am looking into getting this book for a lesson. Could you guestimate for me how long the narration was? I saw the book will be 40 page long, but I don't know how that would coordinate into a book.